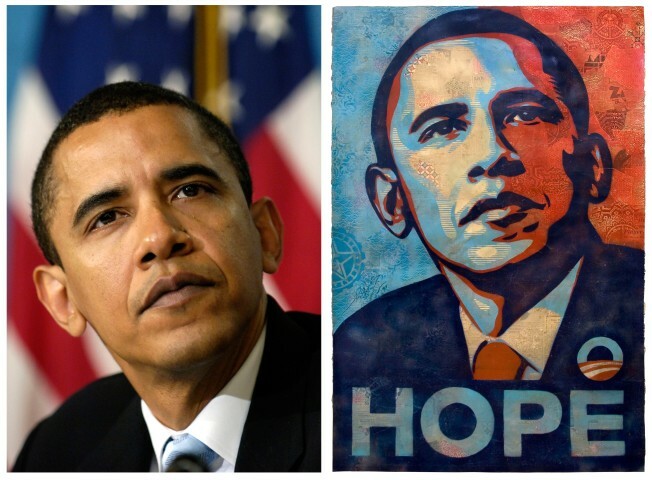 A poster of President Barack Obama, right, by artist Shepard Fairey is shown for comparison with this April 27, 2006 file photo of then-Sen. Barack Obama by Associated Press photographer Mannie Garcia at the National Press Club in Washington. NEW YORK — On buttons, posters and Web sites, the image was everywhere during last year's presidential campaign: A pensive Barack Obama looking upward, as if to the future, splashed in a Warholesque red, white and blue and underlined with the caption HOPE. Designed by Shepard Fairey, a Los-Angeles based street artist, the image has led to sales of hundreds of thousands of posters and stickers, has become so much in demand that copies signed by Fairey have been purchased for thousands of dollars on eBay. It's being included this month at a Fairey exhibit at the Institute of Contemporary Art in Boston.